"This year’s event attracted over 12,000 people, and much of the success can be attributed to groups like yours!". 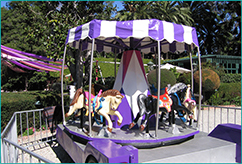 Transform Your Event into an Amusement Park!! 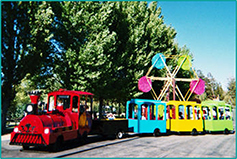 Carvinal Rides are a great way to ENTERTAIN LARGE GROUPS of kids and adults alike!! 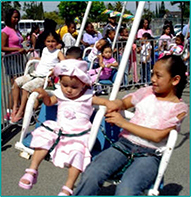 From smaller rides for a backyard party to large festivals, our rides are sure to be a HUGE HIT!! We deliver, set up, inspect and operate, and break down all of the equipment!! We have many great options for your event!! 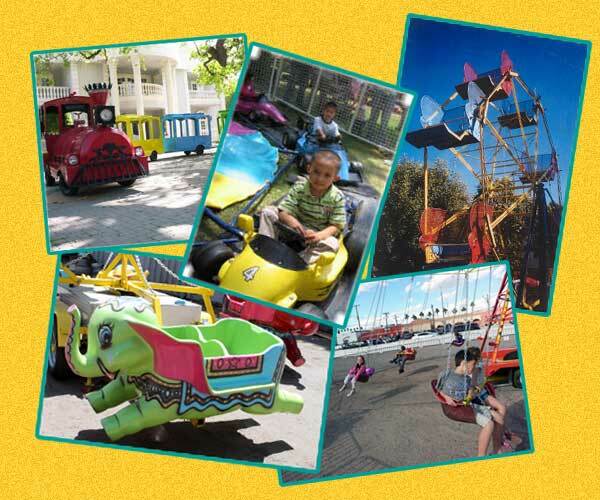 CHECK OUT THE CARNIVAL RIDES BELOW! Set-up Requirements: Flat surface, paved or grass, 15‛ in diameter. 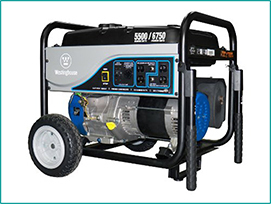 Electrical Requirements: (1) 20-amp, 110 volt outlet or generator within 100‛. 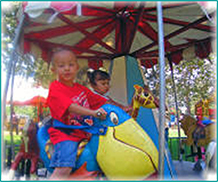 Features EIGHT circus animals! Four are stationary and four move up and down as the platform turns. Includes carnival music! 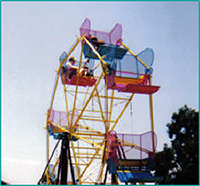 Our 12‛ high Ferris Wheel features SIX fully enclosed baskets. Perfect for younger kids!! 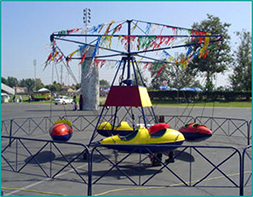 At nearly 15‛, our Medium Ferris Wheel features SIX fully enclosed baskets. Popular with older elementary age children! Electrical Requirements: (1) 20-amp, 110 volt outlet or generator within 100′. 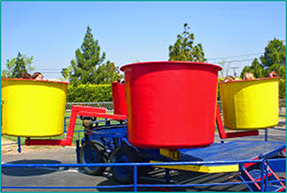 Our 20‛ tall Large Ferris Wheel features SIX fully enclosed baskets. A GREAT centerpiece for any event! Electrical Requirements: (1) 30-amp, 110 volt outlet or generator within 100‛. At 25‛ tall, our Super-Sized Ginormous Ferris Wheel features old-fashioned style open seats. Great for kids and adults alike!!. Set-up Requirements: Flat surface, paved or grass, 25‛ in diameter. Electrical Requirements: (1) single phase 30-amp, 220 volt outlet or generator within 100‛. Complete with bells and whistles, the little ones will have a blast as they ride the pre-set track on their train ride adventure!! Set-up Requirements: Flat surface, paved or grass, 28‛x10‘x3‛ OR 18‘x8‛x3‘ Electrical Requirements: (1) 20-amp, 110 volt outlet or generator within 100‛. Kids of all ages LOVE riding the three uncovered passenger cars! Rubber tires allow it to run on almost any flat surface. 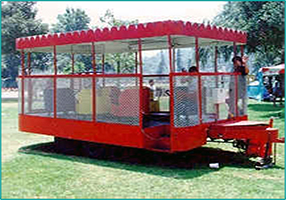 Set-up Requirements: Flat surface, paved or grass, at least 35‛ turning radius. Electrical Requirements: None (gasoline powered… gasoline included). 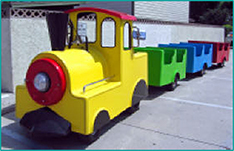 With larger, covered cars, our Fantasy Train captures the imagination of kids and adults alike!! Can run on almost any flat surface! 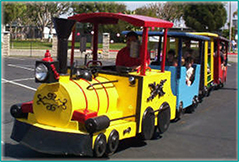 With a large red engine and FOUR multicolored cars, our Circus Train can haul OVER 30 kids and adults! Runs on almost any flat surface! 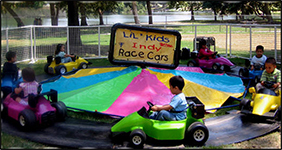 The little ones will LOVE racing around the track. Up to EIGHT racers at a time! Electrical Requirements: (1) 20 amp 110 outlet or generator within 100′. 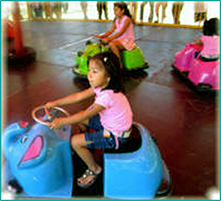 The kids will have a blast as they drive their elephant, beaver, pig, hippos, dogs and bear-shaped cars around and into each other! Includes Attendant, 32‛ x 32‛ (10 cars) or 16‛ x 16‛ (5 cars) covered floor & metal rail fencing. 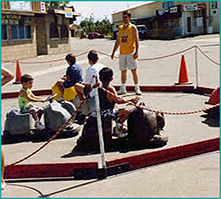 The same fun Bumper Cars with a wood board perimeter and a rope fence. 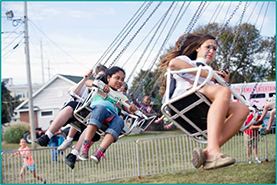 Kids LOVE riding the suspended chairs of this classic ride! TWICE as much fun as our regular Swing Chair Ride!! 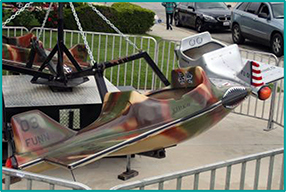 Similar to the Swing Chair Ride, but features WWII airplane auxiliary tanks instead of chairs for seats! 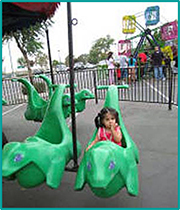 SIX double dino chairs create a fun adventure for younger kids! 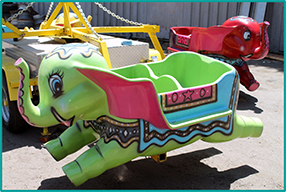 Up to 16 kids at a time can share the adventure with our Flying Elephant Ride! 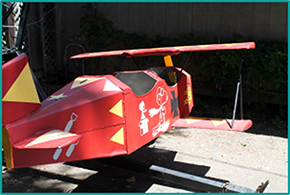 Launch the kids into FUN with our Jet Plane Ride! Our biplanes add some old-school excitement to any event!! Riders have a GREAT TIME as they spin and turn in our Tubs of Fun ride! SIX cars rotate along an oval pathway in our enclosed, elevated platform, whipping and spinning the riders!